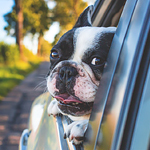 More than ever, people are traveling from place to place with their pets in their vehicles. While car travel can be a fun event, it can also be a disaster if you don't plan properly or if your pets become overly excited or nervous. Here is how to plan journeys with your furry friends. Make sure all microchip and license information is updated. Your pet should be properly crated or restrained inside your vehicle so it does not jump on you or cause a distraction while driving. Never let your pet stick its head out of the window while your vehicle is moving as that can be dangerous. Your pet should never be with you in the front seat. If the airbag deploys in the event of a crash, it could kill your dog or cat. Dog guards or gates are good choices for confinement in an SUV.